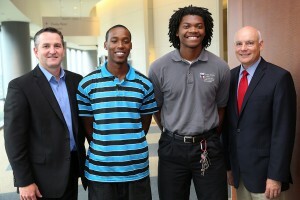 SE student activities director Doug Peak and SE Men of Color participants Otis Ervin and Dominique Spencer Jr. are joined by SE president Bill Coppola. If the past is any indication, more than half the African-American and Hispanic males who enrolled at TCC for the first time this semester won’t be back next year. Joy Gates Black hopes a new program — the Men of Color Mentoring Program — will change all that. Gates Black, vice chancellor for student success, spearheaded the implementation of the initiative. “It is a creative and unique program that will give minorities with a need for a little extra help an equal chance at completing and excelling in college,” she said. African-American and Hispanic males are the least successful demographic group at TCC in terms of grade-point average and course-completion percentage, Gates Black said. Data show that only 44 percent of first-time-in-college students from that group who enrolled in the fall of 2010 attended the following fall. The program aims to increase retention and completion rates for African-American and Hispanic males in regards to their degree audit programs, increase the awareness and use of available support services by this group and provide opportunities for civic engagement through community projects. Strategies include personal mentors, specialized tutoring, specific and specialized degree plans, extra curriculum, financial aid and close contact with area businesses and programs to help students stay involved in their community. The program will be managed and funded through the current Title III federal grant aimed at increasing student success. The program is under the overall direction of TCC director of student success Christopher Douglas, and its coordinators are Renee Rosales and Freddie Sandifer. Douglas said Men of Color held its first meeting Sept. 28. Each TCC campus has its own group and, while not all campuses have held an initial meeting yet, monthly meetings will be held on each campus. A meeting is scheduled Oct. 24 on NW Campus. “We are really trying to establish the program,” Douglas said. In each meeting, a specific success topic is covered, and conversations are initiated with students to see how they are doing in their classes and in their lives, Douglas said. These conversations can take place privately as mentors are in contact with students weekly and in face-to-face meetings with them twice a month. “We are in the process of matching mentors with mentees,” he said. Douglas said those who have attended so far are excited, and he thinks by the end of the semester administrators will have a better idea of the program’s impact. Gates Black said faculty and staff are also invited to participate, and those who do so will receive specialized training on connecting with minority students and keeping them in school. The impetus for programs like the Men of Color Mentoring Initiative comes after the publicized success of similar programs at other large, urban community colleges, Gates Black said, including those in Dallas and Houston. “Many of the campus deans have been begging our office for something like this for years, and it just seems like a no-brainer for student success, which is our goal,” she said. Gates Black said she hopes such programs will eventually prove themselves to the extent that they become mandatory for every college. Students wanting to participate in Men of Color may contact Douglas, Rosales or Sandifer for more information. They can also consult the advising and counseling office on their campus. “If there was one thing I could see come out of this program, it would be a significant percentage increase in the amount of successful African-American students who will graduate here and pursue higher education elsewhere,” Gates Black said.